The beach resort of Palmas del Mar lies on the east coast of Puerto Rico and it’s one of the largest in the Caribbean, offering a wide range of sporting activities, including fishing, tennis, equestrianism and, of course, golf. Charles Fraser was the developer here, the man who set up Sea Pines Plantation on Hilton Head Island. Palmas Athletic Club has two championship courses on site: the newer Flamboyán is a 7,117-yard layout by acclaimed architect Rees Jones that opened in 1998 and its sister course Palm is a smaller, par 71 track that was originally designed by Gary Player in 1974 and later reworked by Jones. Fairways of the Flamboyan course at Palmas del Mar fan out alongside a 20-acre freshwater lake, some intersecting the Candelero River while others border the Caribbean Sea so water certainly plays its part in proceedings here. The signature hole is the 12th, a solid par three which requires a sturdy blow from the tee box into the prevailing wind to a raised green that sits behind a canal with the island of Vieques as a beautiful backdrop. I played the Flamboyan course during the 2011 Xmas holidays and really enjoyed the layout, the challenge and the warm sunshine and tropical breezes. The only let down was the condition of some of the greens which had either suffered a disease or were just far too neglected by players not repairing their damage. Either way, it didn't overly detract from the round but could be improved. I should note that the two courses at the location "Palmas Del Mar" (the housing area or suburb name) are now run by the Palmas Athletic Club. It seems there was a financial problem with the developers / marketers or someone else and the golf courses might now be a seperate entity. I couldn't book a tee time online (they have a phone number on the website if you want to call Puerto Rico) but was looked after by the Director of Golf (Mr Seth Bull) after I'd emailed their enquiry address. The course is set on or around wetlands and that means there are a significant number of holes where large lakes or thick reed beds are in play. Unlike a number of courses I've played, this course has the hazards very much in the line of play and requires tee shots or approach shots to carry the hazard. The course really asks how brave you're feeling and how much you trust your swing. The most interesting holes for me were: the 3rd a par 5 that works its way right around a lake. The tee shot allows you to choose how confident you are and how much water carry you want to try and make the hole shorter with. The water continues all the way down the right hand side to and around the green. The 6th has water in play on the left in the approach area and around the green and significant undulating hillocks on the bail out area to the right. The 12th is the signature hole, a par 3 that only requires a mid iron and probably has a nod to the Redan in it's style. 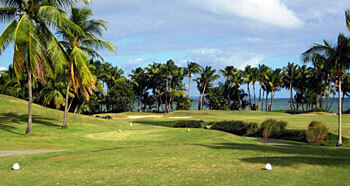 Behind the green is a line of palms and the Caribbean Sea - a great view to tee off toward. My favourite hole was the 13th, a short par 4 with water down the left in the driving area and a creek across in front of the green for anyone trying to hit driver and getting a bit too much of it. There are also a line of bunkers down the right side of the fairway for those who bail out away from the water and they make it more difficult for the short second shot into the green. Oh, and the hole curved left from tee to green bringing the water and bunkers more into play. It was a hole that looked great to the eye and required thought and then precise execution and I three putted it to bogey from about 10 feet! A great hole and yet another reason why the game can drive you crazy when you think its going so well. In summary, Palmas is a little out of the normal tourist areas in Puerto Rico and at USD107 for the round it's not that cheap either - but if was ever going back to Puerto Rico I'd head away from San Juan and the north coast to play the Flamboyan course (and the course at Coamo Springs - a bargain round) again.